just note i made an easy assembly board to make the work easier and better. Just succesfully completed its testing, the sound is loud and clear, no clipping or noise, thanks to PCB connections. With this board it will be easier to fit arduino and their components inside the PVC pipe, saves extra cables and work, no mistakes. 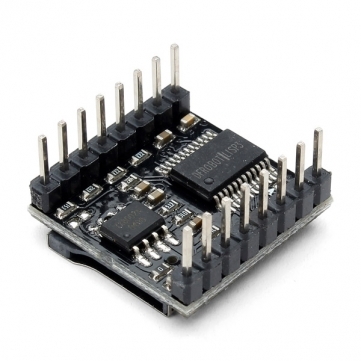 I have in my hardware teensy 2.00 ++ hardware, yes I know it´s not arduino but I can programe it using arduino code, the only thing it´s will change the pinout position. The trouble it´s when I compiled your .ino files...appears errors, seams to fault the libraries or some similar stuff to complete the compiling process. Here quoted I show you the compilling message .txt. Thx a lot for your kinddly attention. The first one pcb its mine. Arduino:1.8.8 (Windows 7), TD: 1.45, Tarjeta:"Teensy++ 2.0, Serial, 16 MHz, US English"
you can find several DFplayer chinese clones on the market but not everyone fit this project. In fact there are fakes clones that don't support the DFplayer libraries. working clones have a chip named "YX5200", blue led status light, silkscreen around all components on board.. Thanks skyone for the heads up! We in the lightsaber building community struggled a lot with fake DFPlayers in the past until we found out that the market is swamped with fakes.